This title is part of the Pearson Modern Classics series. Pearson Modern Classics are acclaimed titles at a value price. Please visit www.pearsonhighered.com/math-classics-series for a complete list of titles. 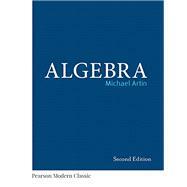 Algebra, 2nd Edition, by Michael Artin, provides comprehensive coverage at the level of an honors-undergraduate or introductory-graduate course. The second edition of this classic text incorporates twenty years of feedback plus the author’s own teaching experience. This book discusses concrete topics of algebra in greater detail than others, preparing readers for the more abstract concepts; linear algebra is tightly integrated throughout. Michael Artin received his A.B. from Princeton University in 1955, and his M.A. and Ph.D. from Harvard University in 1956 and 1960, respectively. He continued at Harvard as Benjamin Peirce Lecturer, 1960—63. He joined the MIT mathematics faculty in 1963, and was appointed Norbert Wiener Professor from 1988—93. Outside MIT, Artin served as President of the American Mathematical Society from 1990-92. He has received honorary doctorate degrees from the University of Antwerp and University of Hamburg. Professor Artin is an algebraic geometer, concentrating on non-commutative algebra. He has received many awards throughout his distinguished career, including the Undergraduate Teaching Prize and the Educational and Graduate Advising Award. He received the Leroy P. Steele Prize for Lifetime Achievement from the AMS. In 2005 he was honored with the Harvard Graduate School of Arts & Sciences Centennial Medal, for being "an architect of the modern approach to algebraic geometry." Professor Artin is a Member of the National Academy of Sciences, Fellow of the American Academy of Arts & Sciences, Fellow of the American Association for the Advancement of Science, and Fellow of the Society of Industrial and Applied Mathematics. He is a Foreign Member of the Royal Holland Society of Sciences, and Honorary Member of the Moscow Mathematical Society.